The south coast of Puerto Rico is considerably drier and hotter than the lusher north coast, but richer in history and culture. The 'Cordillera Central' ( central mountain range) captures the rain and little of it gets over the mountains. 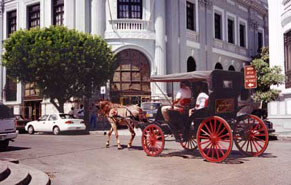 Ponce is the largest city, sometimes called the 'Pearl of the South'. A days drive could well start at the southwest tip of Puerto Rico from Yabucoa to Maunabo then along the scenic south coast. There are many scenic vistas and lovely beaches to walk on. the swimming is not great in this area, rough but scenic waters. Guayama is a town with a bit of history to see. 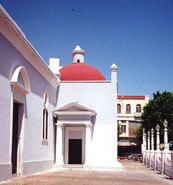 'Casa Cautina' is a restored house on the plaza that has been turned into a museum. Stop in Coamo and take a dip in the thermal springs just outside the town ( Newly rebuilt facilities and a $3. fee, better security than previously. Hours are until 9 PM now). . Arrive in Ponce late in the afternoon and stay near the plaza at Hotels Ramada or Belgica, or the new Fox. Dine in the Ramada Hotels' 'Lola' Restaurant on the Plaza. 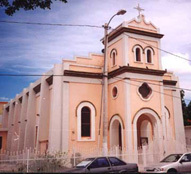 Ponce is a very pleasant place to spend an afternoon and evening walking around the heart of Old Ponce. Spanish Colonial architecture, and a quiet dignified old plaza, pretty fountain ( presently broken, won't work again until 2015). Be sure to visit the Museum of History of the City of Ponce, next to the Ponce La Perla Theatre, for the architectural wonder of the building! Art Nouveau details and lovely stained glass throughout. Next morning head out of Ponce, one of three ways. You can can go west towards Guanica or you could go up Route #10 to Adjuntas. You could also visit the Ponce Art Museum or spend an amazing day at Caja de Muertos Island, turquoise waters, a tropical paradise out to sea from Ponce. Caja de Muertos Island ( Dead Mans' Chest) can be visited by a private boat company on weekends and holidays only, a 45 minute ferry ride. You must make reservations in advance with a credit card. Cost is $25.53 for the round trip. It leaves the Guancha area (waterfront) in Ponce at 8:30 am and returns from the island around 4 pm. ( the 'deluxe' package includes hot dogs and chicken and liquids on the island for $50.+ per person) call Tel. 787.842.8546 for reservations and information. Once you have made your reservations you must check in at 7:40 AM.  A great day can be spent driving west from Ponce towards Cabo Rojo. The Dry Forest is near Guanica. It is very hot to walk in this forest. Early morning would be your best bet, summers are impossibly hot to try to hike here.  Gilligans' Island ( next page) in Guanica is a great swimming and snorkeling excursion. The private ferry takes you from the dock just beyond the Copamarina Hotel to the dock on Gilligans Island for a few dollars. Clear water and white sand with a cool current running through the mangrove canals. A wonderful place to spend a few hours.  La Parguera is a small town on the coast beyond Guanica that has become a local tourist destination, often quite crowded, known for its' seafood restaurants and the bioluminescent bay. This biobay is no longer very spectacular due to the loss of brilliance as the dense dinoflagellate population has practically died out. Biobays are very fragile ecosystems and are often destroyed before neccessary protections have been put in place. The biobay in Vieques is the healthiest and consequently the brightest. The Biobay near Fajardo is also much brighter than the La Parguera one is now. See Biobays page for more information. 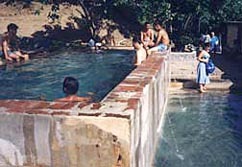 The Old Public Pool at the Coamo Hot Springs/ Photo above right. It is now comletely modernized with facilities. Presently these pools are being well maintained they are probably cleaner than the Paradors' Thermal Pool. (which is also very clean). I like the public pool because it is hotter (closer to the source) but if you prefer you can pay a small fee and use the facilities of the Parador or you may like to spend the night at the 'Parador de Coamo'. (modest facilities.) They have the ( not so hot) thermal pool and a regular swimming pool. Nice restaurant too. The Salinas Yacht Club is not too far away and their hotel is modest, pleasant and more economical. In the mangroves, on the water, enjoyable, except on weekends when it is noisy and crowded. Detail from the Guayama Plaza fountain. 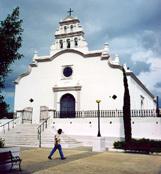 Guayama has a restored colonial house turned into a museum, right on the plaza. 'Casa Cautina'. Museum closes at 4 PM and closed on Mondays.